Question: how many Lewandowskis do you need to complete a footballing behemoth like Bayern Munich? Answer: two, when you take a supreme goalscoring giant like Robert and add his phenomenally talented namesake Gina to the equation. Much has been made of Polish powerhouse Robert, whose Bundesliga exploits make waves in the international sporting press year after year. 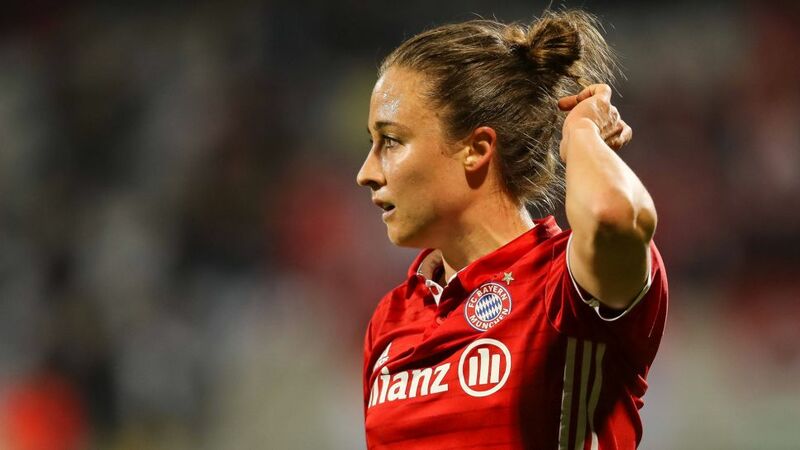 Yet for versatile defender Gina - who lines out with Bayern's women's team - trophy success has also derived from a will to impress during a professional career that began with "a leap of faith," back in 2007. Now, eleven years later, Gina Lewandowski has collected three Frauen-Bundesliga titles, two DFB Cups and a UEFA Women's Cup [precursor to the UEFA Women's Champions League] following almost 230 games in all competitions in Germany. The springboard to success began for Lewandowski at Lehigh University in her native Pennsylvania. After graduation, she sought opportunities to carve out a career overseas and was subsequently offered trials with FFC Frankfurt. Having caught the eye of the club's coaches, she was given a chance and hasn't looked back since. In an incredible first year at Frankfurt, Lewandowski played in central defence as the team collected a domestic and European treble. She would go on to feature in 97 games for Frankfurt before her move to Bayern after a brief stint at Western New York Flash. "It's a great experience to have. It's part of my life and we'll see how long I can stay at Bayern," the 33-year-old said in an interview with the club's official website. "Bayern is a huge global club and I am proud to be part of it and the development of women's football," Lewandowski added. "We used to train on the outskirts of town, now we train on the FC Bayern campus. I'm proud to have taken these steps with the team and the club and to see that women's football is constantly growing and improving." Since arriving in Bavaria, Gina Lewandowski has won back-to-back Bundesliga titles and currently forms an important part of the side doing battle for domestic supremacy with Wolfsburg. Now playing in a wider defensive role, she is not in a position to fire at the target as much as her namesake with the men's side, but that doesn't stop the American from studying and admiring Lewy's technique in front of goal. "The way he scores goals is truly impressive. The way he's able to find the back of the net with one or two touches or via a turn or with his head. It would be nice to have a little bit of his talent," Gina told FCBayern.TV. "I would love to play with him. We have met each other before but I would like to do so on the pitch too!" That meeting came after both found the target in their respective games a few years ago, Bayern using the opportunity to showcase two of their top talents. The player with one U.S. cap is loving life in Bavaria - where she has been since 2012 - and has stated she one day sees a possible future step into coaching. "The culture and the way of life here are very enjoyable," she explained. "I like to cycle into the city, or to visit the English Gardens, which are truly beautiful and a really nice place to chill out. I am a very calm person, perhaps not like your typical American who is more outgoing. I am a bit quieter." Celebrating a stellar career at the top of the European game, Gina's rise to the pinnacle of football may not have garnered as many headlines as that of Robert's journey to global success, but both have proved there is room enough for two Lewandowskis at one of the world's biggest clubs.